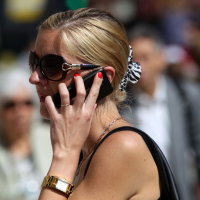 British holidaymakers will benefit from the end of mobile roaming charges this week. From June 15 onwards, people travelling between different European Union (EU) member-states will no longer face extra charges to use their regular allowances of calls, texts and data. While the Brexit process means it is unclear how long the end of roaming charges will apply to UK travellers, it should at least prove positive in the short term. The legislation, called Roam Like Home, seeks to prevent travellers from racking up huge bills when using data or making calls within Europe. European Commissioner Gunther Oettinger said the plans are part of the EU's wider goal of improving the daily lives of Europeans. He said that roaming costs will soon be "old memories". Mobile phone costs are among the financial issues Britons need to consider before heading abroad, along with things like travel insurance and transport. But experts are warning that the end of roaming fees could come with caveats attached. For example, consumer group Which? has noted that the regulations only apply to roaming. And that means the costs of calling EU countries from the UK will still vary. People who exceed their agreed allowances will still be charged as they would at home, meanwhile. Roaming territories can also differ between mobile network providers. For instance, the Channel Islands, the Isle of Man, Monaco and Switzerland are among the territories which may be covered by some packages but not others. Alex Neill, Which? managing director of home products and services, said: "Many will reap the benefits of these changes and will no longer be put off from making calls abroad. However, it is important that you take a close look at what is or isn't included in your current mobile deal. Not knowing what's included could lead to some surprising charges on your next bill."